My kitchen makeover adventure is nicely on course, and it’s going pretty great after just the one bump in the road when a funny thing happened on the way to the paint store. After that slight detour it was full speed ahead to my first stop, painting the kitchen cupboards and leaving the old sagey green in the dust with absolutely no regrets. I’m staring with this cupboard, which is between my fridge and stove. All you need to paint your kitchen cupboards happy is a colour that you love. This fabulous blue is Beauti-tone’s Enchanted Evening. I got it on sale for $30. It’s a high hide water-based paint and primer combo, and I only needed one coat with just a few touch ups here and there. The green paint was also water-based so I didn’t need to sand at all. If I was starting with wood cupboards there would be a lot more prep work needed. All I had to do was wipe down all the cupboards so they were nice and clean. I just used a light soap and water combo and a rag, and then just water to wipe afterward to make sure there was no soap residue. You could certainly use TSP if you think your cupboards need de-greasing, but I haven’t fried anything in years and I didn’t see any grease on them anywhere. This is my fourth time painting these old cupboards in 19 years, and if my memory serves me correctly it’s the 8th kitchen makeover that I’ve done in my life. And no I’m not a masochist… I just get bored, and I love to paint stuff. Here’s all I need to paint my kitchen cupboards. An angle edged brush is a must. I’ve had this small one for years. The first thing I always do with a can of paint is put holes into the inner rim with a hammer and nail. 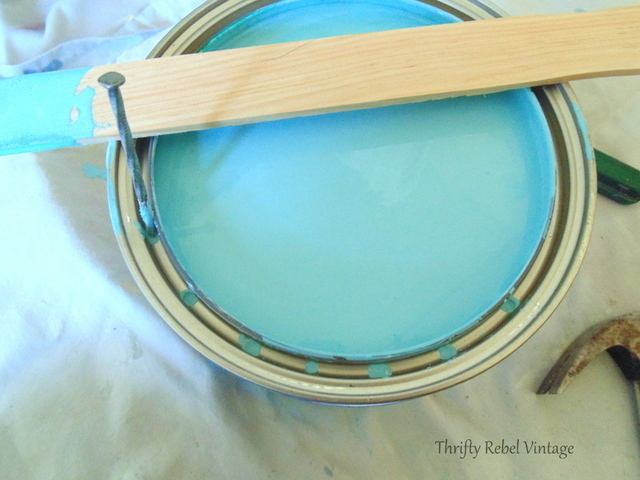 This allows any excess paint to drip back into the can. 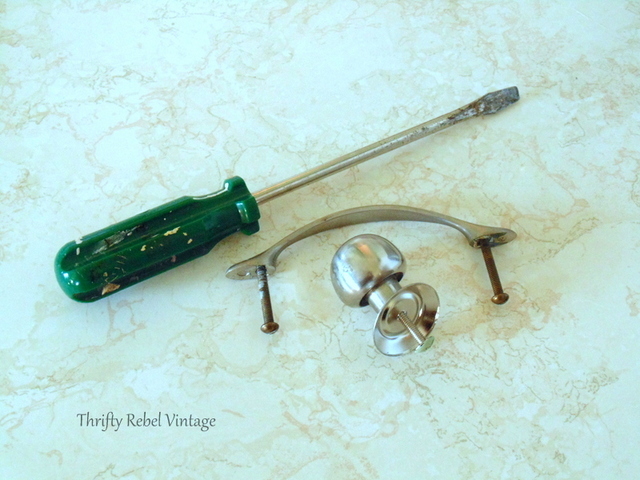 In all my kitchen painting escapades over the years I’ve never removed a hinge or a door, and I only remove a drawer if it’s absolutely necessary… meaning no matter how I contort my hand or my brush I cannot paint around it. The only things I usually remove are the knobs and handles on the fronts. And actually one very stubborn knob wouldn’t come off so I had to paint around it. 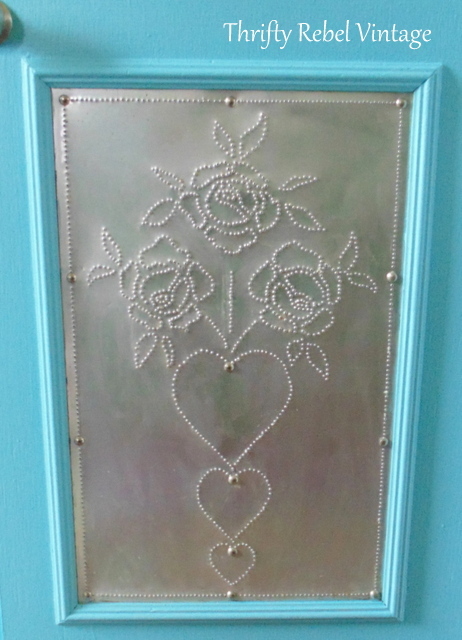 To paint the molding that surrounds my punched tin panels I used a thin piece of cardboard (like a cereal or kleenex box) to protect the metal and I made my way around. I always do the door fronts first. I let the doors and drawers dry , and then I paint around the cabinet fronts using a thin piece of cardboard again, where necessary. The angled brush also works great painting around the hinges. The trick is to not have too much paint on your brush. After I’ve used my angled brush to paint around the hinges, I use my small roller to do the rest. I paint the insides of the doors after the outside has dried. 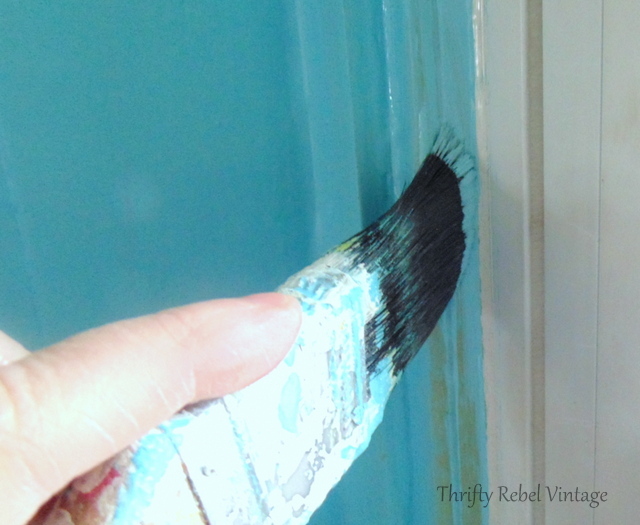 It helps to be able to hang onto the front of the door while painting the back. 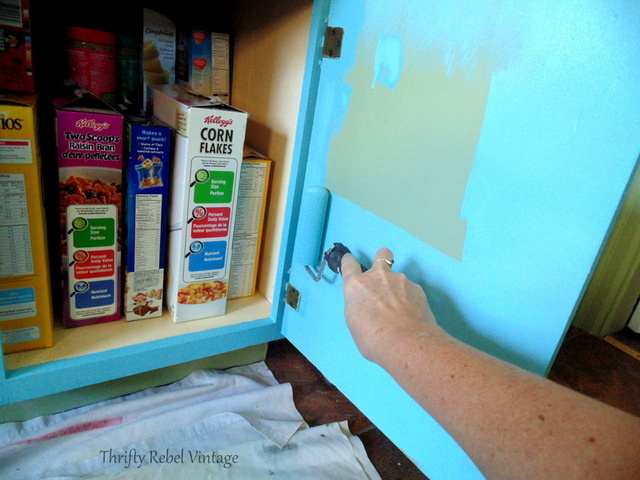 I used my angled brush to paint around the edges of the sides of the cupboard. Then I used my roller to finish it up. It’s amazing how much time this little roller saves. Here you can really see the difference between the old colour and new. The new blue is so bright and happy. I haven’t used painting tape in decades. Old houses like mine are wonky, and pretty much nothing in this kitchen is straight or plum, so taping around everything is my idea of a redecorating nightmare. I’d rather be painting than spending all that time taping. With my angled brush, a steady hand I can move along pretty quick. Again, like the hinges on the doors the trick is to not have too much paint on the brush. This can take some practice, so painter’s tape can certainly be used. 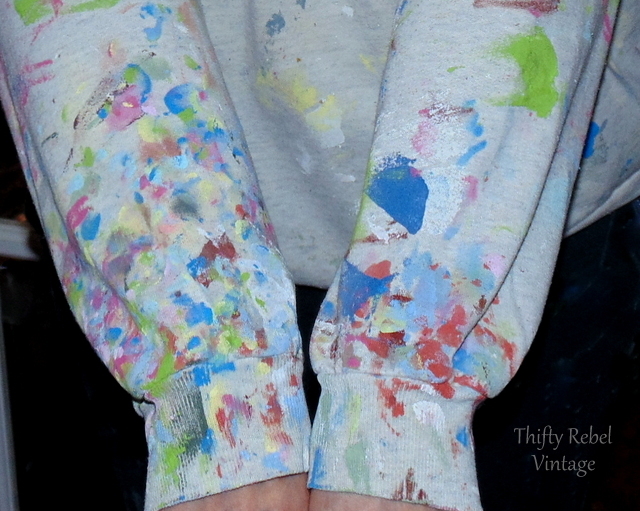 I don’t worry about making oopsies because that’s what my favourite painting clothes are for… especially sleeves. They’re great for cleaning off minor drips and ooopsies. So, here’s my main wall of vintage cupboards in the sagey green. This past weekend I painted the kitchen walls and ceiling. Now all that’s left are the front door and the basement door, and some edging at the ceiling in front of the cupboards. 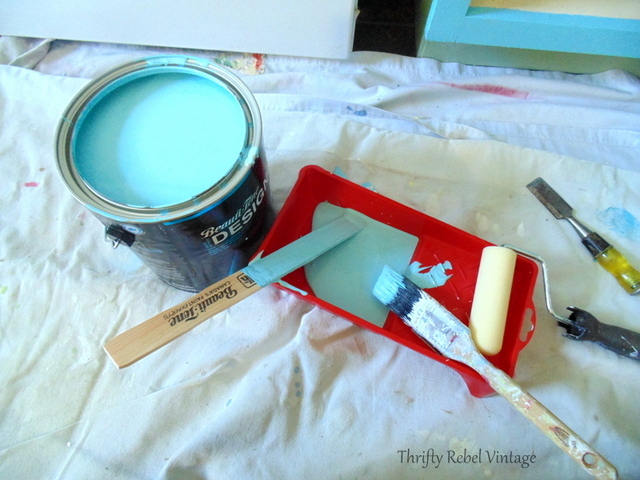 Need more tips to help with your next painting project? Get the password for the library with the free tips by filling out this form. 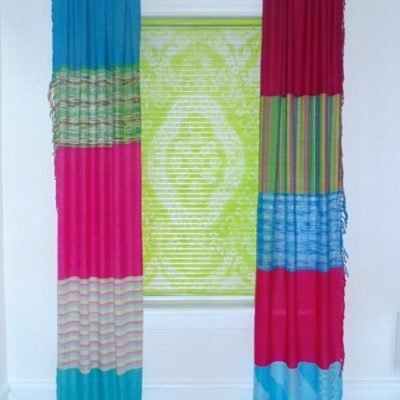 I sometimes share my projects and posts at these fabulous parties listed here. Thanks so much Dona! So sorry to hear about the gall bladder, but glad you’re all right and back on track. Good for you too! So bright and fun! I would love to cook in there. Great job? It looks great Tuula, you are a painting ninja!! ha ha! I don’t use tape either… hardly ever. I love painting too and have gotten pretty good at it so tape isn’t really needed. 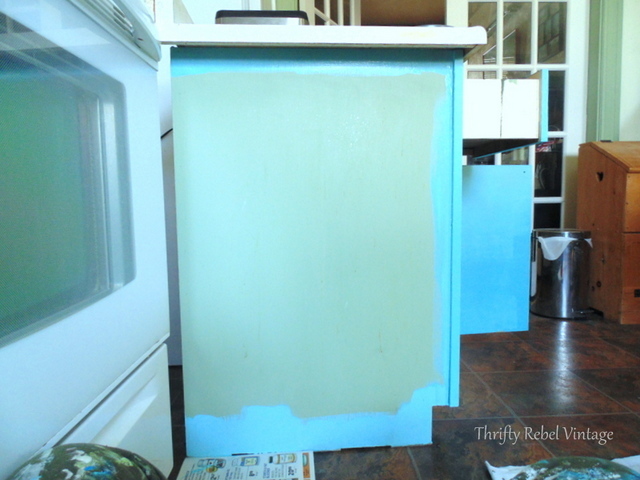 I’m planning to start on my kitchen soon but my cabinets have never been painted before so there’ll be more prep. Thanks Tania! I do love to paint, except ceilings not so much. My neck got quite the workout. lol. I’ve been lucky, in all the kitchens I’ve painted over the years I’ve never had to start from wood cabinets. I don’t envy you the prep, but am looking forward to seeing your cabinets. The color is so you, Tuula! And it looks absolutely lovely in your kitchen! Can’t wait for the finished shot! Wow, you have really moved fast on them & they look great! What does your hubby think? Those are great painting tips too. I didn’t know about drilling holes in the top of the can. Gonna have to try that one! 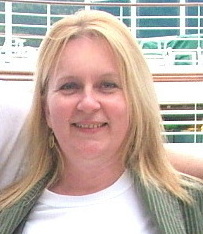 Love your shirt…I have one just like it I’ve saved for big projects. Love it Tuula. 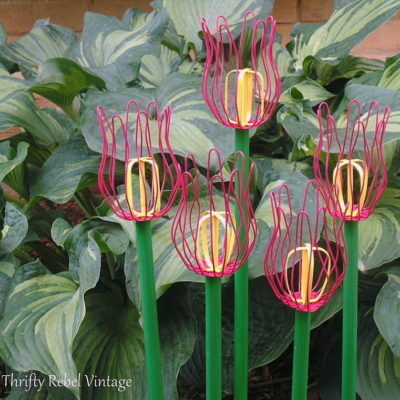 That color is so cheerful and pretty. You go girl. How nice to not have to sand in between colors and that the blue covered the green in one coat! It looks great and I can’t wait to see how you do the rest of your to-do’s to finish the kitchen. Thanks AnnMarie! I wasn’t sure what the coverage would be like because the blue is quite lighter than the green, but it did a great job. I’m always amazed what a good quality paint can do. Tuula I hate to paint but I love to cook. Come to Connecticut and paint my cabinets and I will cook for you. How does that sound? I am only kidding but there is always some truth in kidding. lol. Thanks for the invite Patty. If I’m ever in Connecticut I might just take you up on that. 🙂 I can’t say I hate to cook, but I certainly don’t mind being cooked for. Thanks so much Kathleen! I have a long way to go still, but at least the main painting is done. As you know, it’s a very big job. Now onto the really fun stuff. The part around the window looks like a different color of blue. Is that because of the bright sunshine, or am I crazy? My wife and I just painted a room. We taped off the baseboards, because neither of us could get on the floor, have a steady hand and paint. I’ve never painted cabinets before. The ones in our kitchen are so cheap that we wouldn’t waste the paint!!! We will just have to wait until we save a reasonable amount of money to purchase new ones and maybe refigure the kitchen. It will be awhile, so we have plenty of time to think about it. 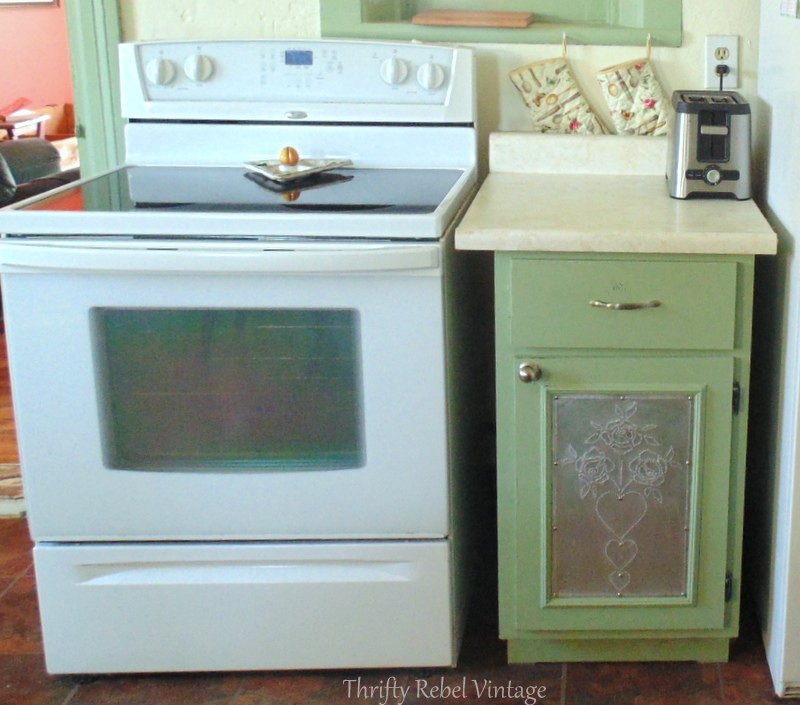 It really is amazing the changes that can be made with just a gallon or two of paint. Thanks Fonda! Yes that is just because of the light coming in through the window. It’s hard to get an accurate pic because of that. 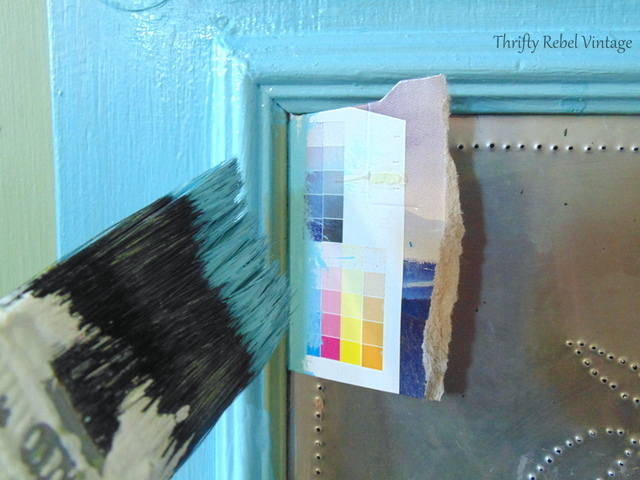 Painting tape is certainly helpful when needed, and I do use it in craft projects sometimes. 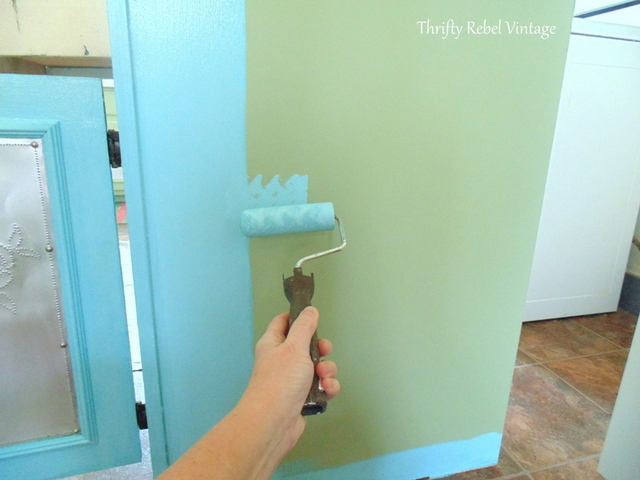 I always say that paint is the easiest and most dramatic change one can make for the least money. 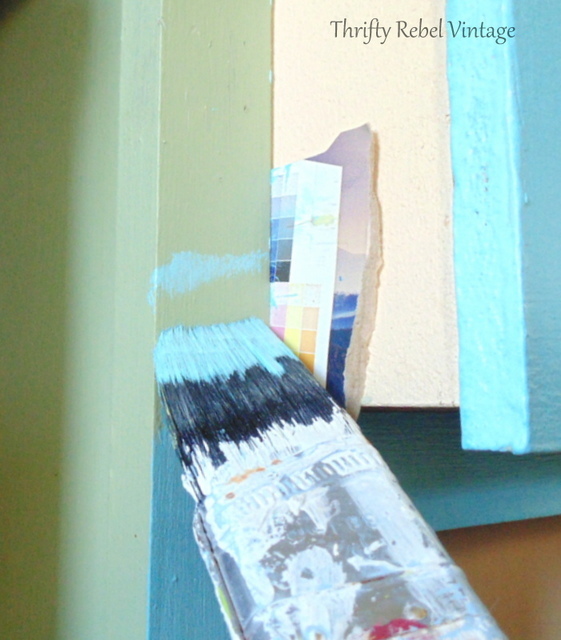 Fonda Rush; I think that light blue color you see around the window is the light shining through the painters tape that Tuula used which makes the color look different than the rest. Tuula, Absolutely love you new kitchen color. What a world of difference a little paint can do. With a pop of red, will be even more stunning. Thanks very much Colleen! I’m on the hunt for red accents that’s for sure. Happy, happy, happy–I love the color, Tuula! 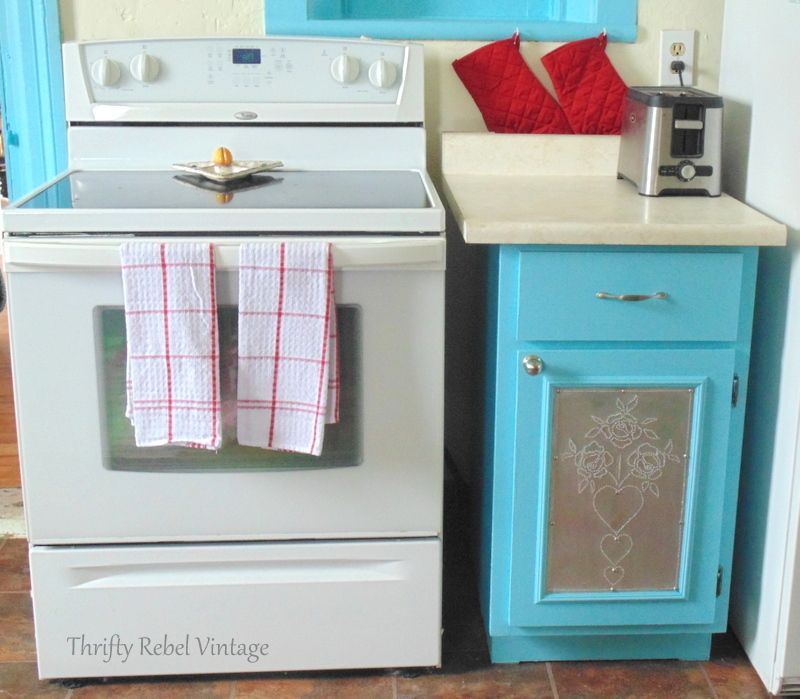 I also have a vintage kitchen. Our home was built in 1905 and the indoor plumbing and the kitchen that is in it now was probably put in in the thirties or forties. 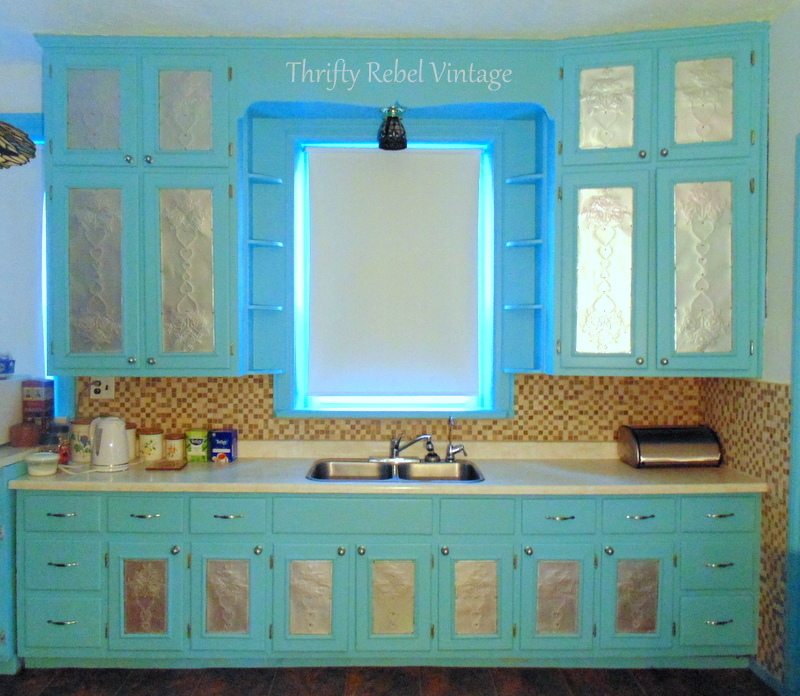 Our cabinets are very much alike, except for the tin facing. 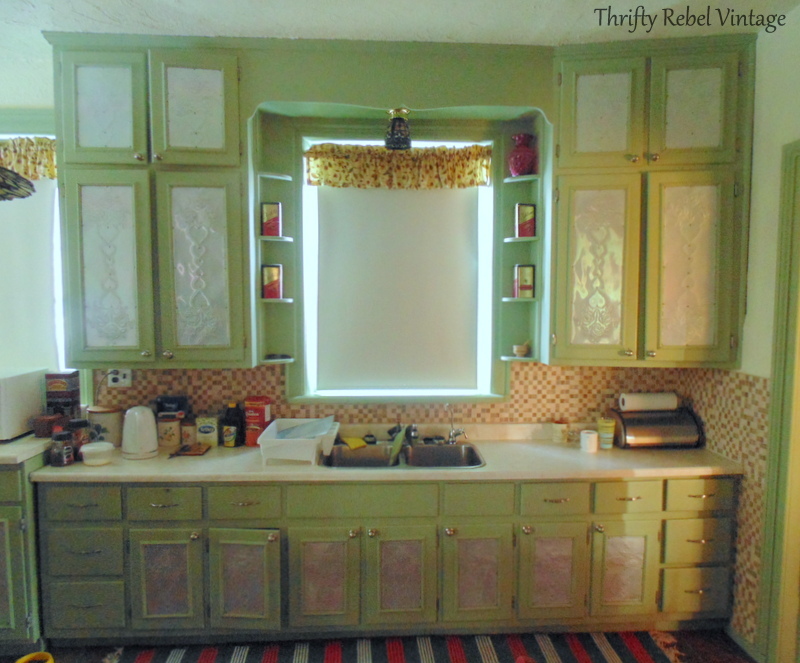 I have a question: What paint do you use on your cabinets and walls in the kitchen, Eggshell, Satin or Semi-gloss? My husband has a sander hooked up to a vacuum that I think that I will have to use on the edges of my cupboards. They have been painted so many times through those 85 or 75 years that they don’t like to stay closed. We moved here three years ago and I painted them, but now I want to change them to all white; I have always wanted an all white kitchen. Looking forward to hearing from you. I use to really enjoy painting, but the joy is starting to fade. lol! Oh, still love painting a piece of furniture, but we are painting all of our trim white instead of tan and I’m tired of it big time!! lol! Looks great, and what a fun color!! Thanks for sharing with SYC. Tuula, The blue is quite a bit brighter! I love the color. Thanks for all the painting tips. Sylvia D.
The blue you chose is definitely a happy colour – very pretty. I love your punched tin doors. Thanks Kelly! I hand punched all the doors myself years ago. It was quite a job, but I still love them. It turned out great. What a beautiful color you chose. Looks like we went to the same school of painting. Thanks Karen! I’m really loving the blue.